Ignition coils for classic cars tend to all look the same, but the fact is, there are some important differences between them, which is why Mini Spares offer a full range of all the coils you are likely to need for a Classic Mini. Coil for Non Ballast/Points Ignition Minis up to 1983…this is the original Mini coil fitted to all cars up to the introduction of the ballast type in 1984, with part number GCL216 – £15.60 inc VAT. Coil for Ballast Ignition – 1983 Minis until 1989 – 998cc only…part number GCL217 (this aftermarket version has the same spec as original) – £16.80 inc VAT. Original Gold Performance Sports Coil…a standard coil can only do so much, and when compression is raised (as in most high performance engines) or improper fuel mixtures occur something better is needed. This coil is a big improvement over stock and is a direct replacement (can only be used on Minis up to 1982). Order as part number MSC105 – £18.60 inc VAT. 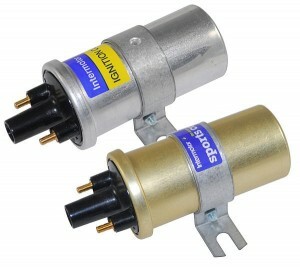 For more details contact 01707 607 700 or visit www.minispares.com ENDS. Print article This entry was posted by admin on February 28, 2013 at 6:25 pm, and is filed under News. Follow any responses to this post through RSS 2.0. Both comments and pings are currently closed.